Well, the Patriot Guard’s Help on the Homefront is making real progress. Daylight can be seen. 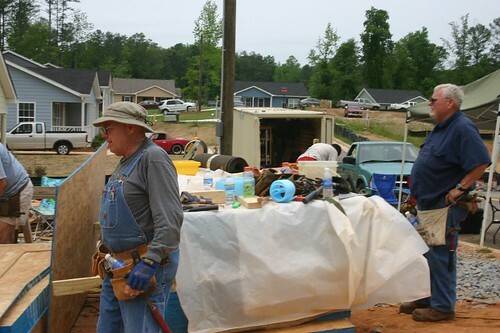 They still need help with money, materials and volunteers. If you can’t be there, money is good! Here is a link to a video/slideshow that shows the home before and with work in progress – and a lot has really been done. If they are to keep the city from demolishing the house as already decreed, then they have to finish the job and soon as the reprieve can be lifted at any time by the city. Enjoy the music in this great video and Please help! Click picture for video or click HERE! The music is great! Oldtimer’s hat goes off to these fine people. Send them something…. They need it Now! 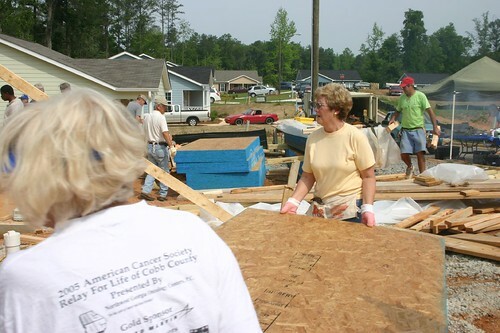 Volunteers can only go so far without buying materials (lumber, roofing, siding, windows, doors, concrete, dumpsters for the debris, etc. 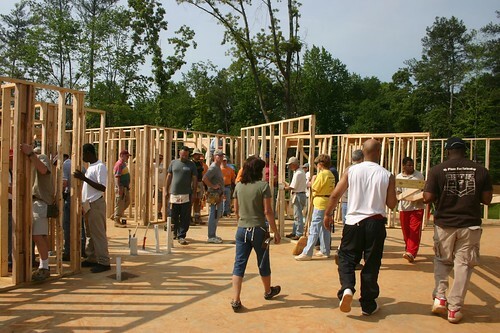 ), and without hiring licensed contractors (electricians, heating, plumbing) – things volunteers are not allowed to do without a license. They need money for these things. You can Help on the Homefront. They are a incorporated as a Non Profit and can send you a copy of the certificate from North Dakota. Send money, get a tax deduction now! To donate money via check: Make check payable to NORTH DAKOTA PATRIOT GUARD and email Tarra to get the mailing address. (Oldtimer: She can also tell you how to set up and use paypal – the information is protected and I could not copy it – please contact Tarra). Today was a good day despite the heat. At least there was a breeze and there had been a light shower the night before to knock down the dust. Today was paint day and siding day. Some volunteers painted the interior with the first coat and others began putting on the siding. 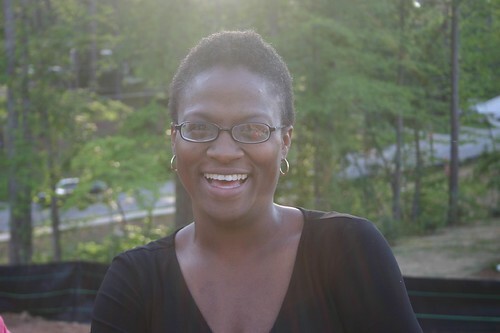 This is a picture of Joi, our future homeowner. 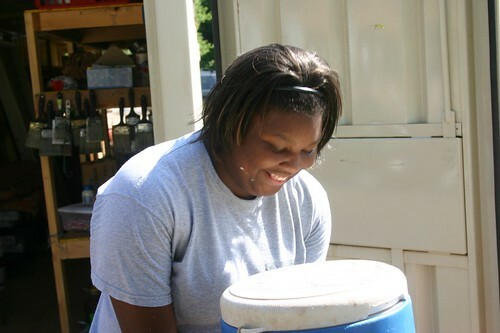 Click here for the slideshow of 44 pictures from today’s build, or click on Joi’s picture. This picture was taken during a break. The background is the supply trailer. 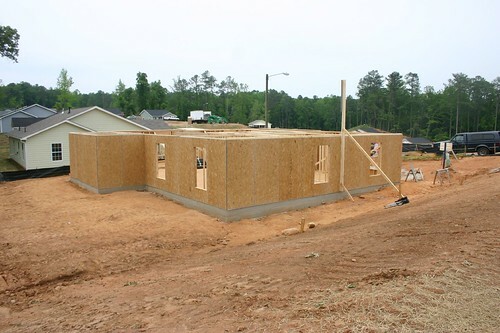 In the slideshow there is a picture of a house being roofed. That is not this house, but since I was not able to be on site when the roofing was going on, I thought I would put that in from a nearby house (taken this morning) to show what it looks like when volunteers are on the roof. It is fun if done early enough in the morning, pure torture if done too late. There is another picture of a house across the street, almost finished. The rest are from this house and the industrious volunteers. 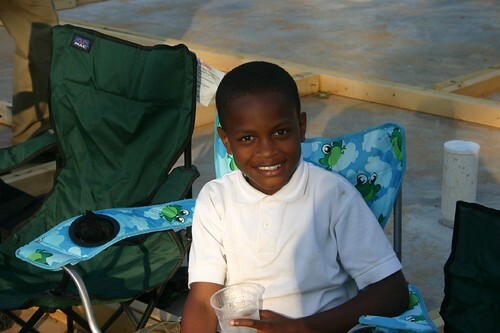 You can click at the link above the slideshow and view the individual pictures. If you click on one you can select various sizes and download anything you want. Enjoy! When we arrived, the drywall was already in, ready for painting. The electrical and the air conditioning is roughed in, but the only power on the site is from the temporary power pole, so there are power cords running everywhere and constantly being expanded on and moved around, shared even. 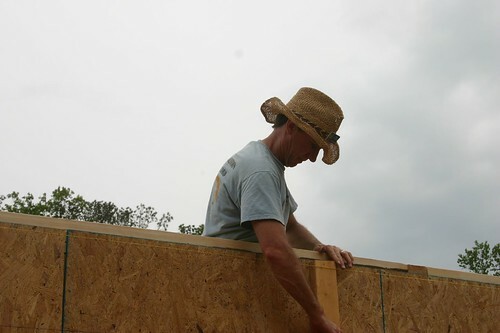 This is the first year that our volunteers have been allowed to use nail guns on the roofing and the first year we have used nail guns on the hardi-plank siding. I’ve included pictures of some of the tools we have used this year, including the shears used to cut the hardi-plank and the lesser desired saw blade made for cutting the masonry boards. The skill saw blade is noisy and a lot of silica dust is generated, calling for face masks and ear plugs. The shears make almost no noise and create almost no dust. It is very efficient even for difficult cuts around windows and doors, for example. Here is a link to the manufacturer of the shears and a demo video. Cost is about $220 for the 404. Hardi-plank is a concrete base siding where multiple layers of fabric are embedded in concrete to make a durable “50 year” non flammable, tough, weather resistant siding made out of a concrete product. It is flexible and fairly heavy, but easy to use. If you have the shears, cutting is quick, simple and safe and there is almost no dust. Another method is the score and snap method where you simply score a line on the siding with a box knife and then break it along the line by bending over an edge. It can also be cut with a special skill saw blade with very few teeth (reduces the dust a little) and can be cut with a saber saw. Some of the crew used the shears and some the skill saw and saber saw. Long cuts and cross cuts with the skill saw. Short cuts for electrical boxes and corner cuts around boxes are best left to the saber saw to clean out the corners. We had been using vinyl siding all these years but so many local city and county governments have raised the bar on construction techniques that zoning in many areas have prohibited vinyl. 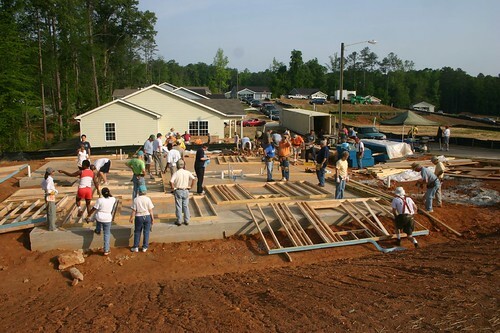 Beginning a couple of years ago, all Habitat houses in this area have gone to the cement fiber board – Hardi-plank. It is a good change. Vinyl can be cracked and a brush fire can melt or burn it. We had one home where a tenat put a barbeque grill on a porch too close and the heat melted a wide area – it drooped and ran. The only drawback is the Hardi-plank siding has to be caulked and painted, whereas the vinyl did not require those steps. The paint is supposedly good for 15 years and the siding for 50. It was a good day and the interior received its first coat of paint and we sided about 30 percent of the outside. The nail gun was a great help. One change from last year was the use of wood trim boards whereas we had used the masonry trim boards in the past. Masonry trim boards are very dense, very thick, very heavy, and require pre drilling the material before putting it up. Wood boards are much easier to work with. Good choice. 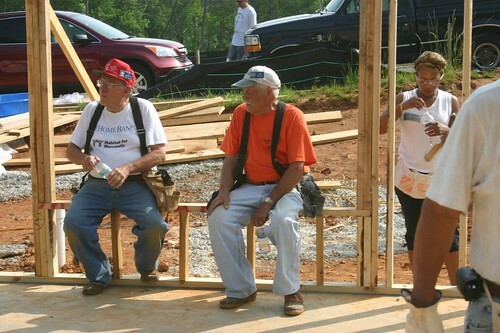 Monday through Saturday of next week is blitz week for the Presbyterian Coalition volunteers. 6 straight days of home building. More painting, more siding, interior door installation, trim work (baseboards for example). Fascia installation and shingles above the front porch. Little stuff mostly. See you there? Look for the Presbyterian Coalition link on the right for directions. Work starts at 8 AM and finishes whenever it gets too hot or we reach a stopping place. Today we knocked off at 3:30 and began cleaning up and putting away. 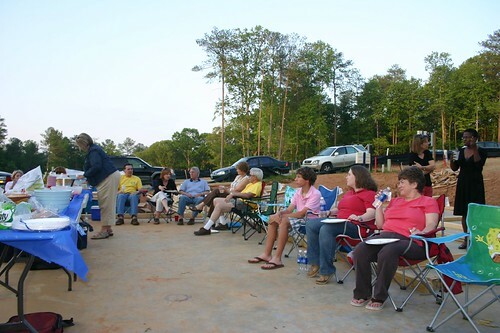 Note: There are links in previous posts to the Habitat “Dinner on the Slab” and to the first day of build, both slideshows and narrative description. 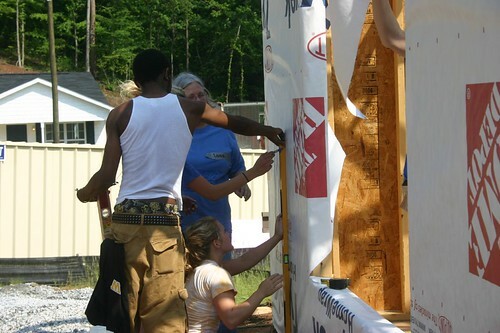 If you click on the link to the right “All Habitat for Humanity Articles.” Or just look around. You might find things that will suprise you. 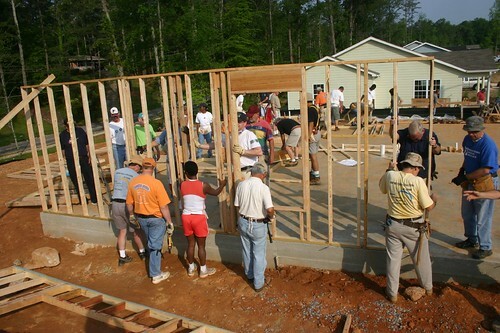 Presbyterian Coalition Habitat for Humanity Slide Show of all the pictures made by Oldtimer at the Dinner on the Slab, May 4, 2007. The morning started out just like last week. It had rained hard overnight, but the site was not particularly muddy and very little water remained on the concrete slab. As usual we had our pep talk, our safety talk and our introductions to the crew leaders. These little talks are needed each time because there are always new people showing up that could not get there on previous build days. 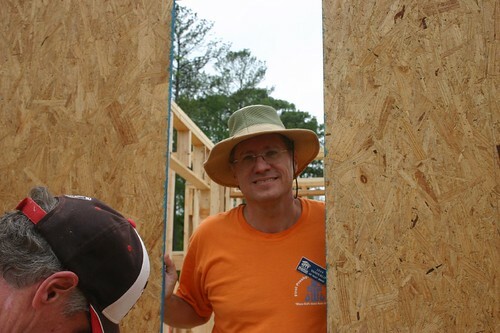 The goal for the day was to safely put up the roof trusses, deck and tarpaper the roof, wrap the house and install all the windows and doors. Short summary: Mission almost accomplished. The deck didn’t get finished and it is not tarpapered. First truss Someone had come in during the previous week and put up safety poles at one end of the house. 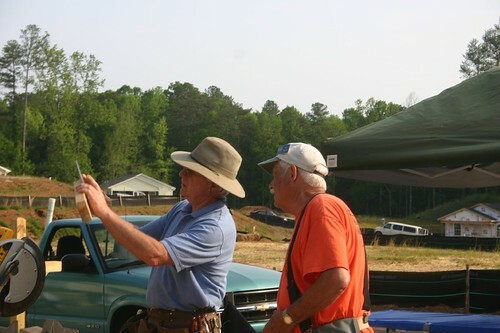 Probably Jeff, the Site Project Manager (SPM) and the “Gray Ghosts”. 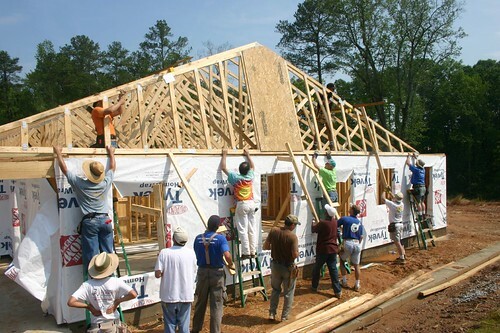 That allows the first roof trust to have something to rest against and to tie to because it is the key to having all the trusses line up properly as they go up. All the other trusses are tied back to the first one. Thus the safety poles serve to stabilize the trusses all the way across and assure none of them fall over and start a deadly domino reaction. 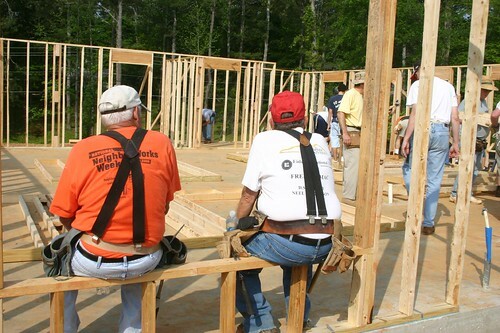 The Gray Ghosts, by the way are an organized group, usually retired builders and handymen, that come in mid week and repair anything that is put up wrong and/or was not finished. 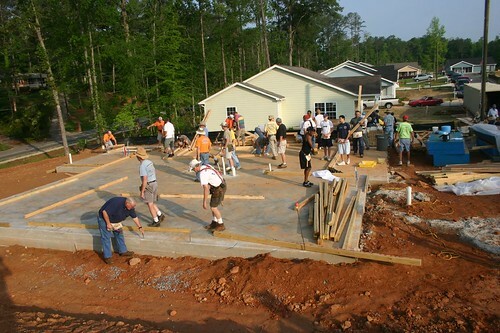 They are volunteers that work one or two days a week to make cetain that builds proceed smoothly. Since they are usually unseen by the volunteers, they are in effect ghosts. They usually come at the invitation of the SPM. The trusses were shipped stacked and nailed together. I had the job of separating them and marking the trusses for alignment purposes. 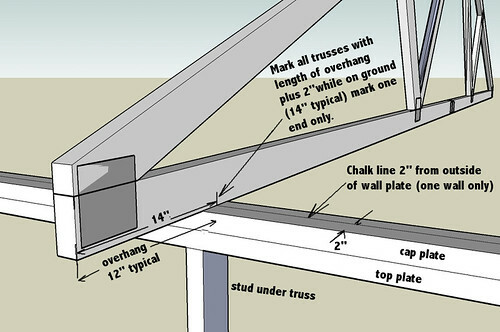 That consists of making a mark on one end of each truss at the 14 inch mark for the purpose of setting the overhang. Each truss also had a mark at 47 inches from each outside edge of the slope for the purpose of setting the first 4×8 row of decking boards. “Wyze Guys” The first truss was lifted by a crew of 6 or 7 people and one end slid up onto the front wall using the forked “Ys” poles shown next to the window. Jeff likes to call the pole holders “Wise/Wyze Guys”. Often the Wise Guys were women. The truss is shoved forward and the poles moved back as the truss went over the wall. Some Wise Guys went inside and helped lift the truss over obstacles such as interior walls until the truss spanned the entire house. 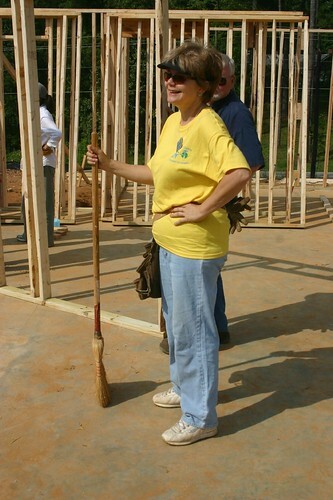 One person at the other end was positioned to align the 14 inch mark with the wall. 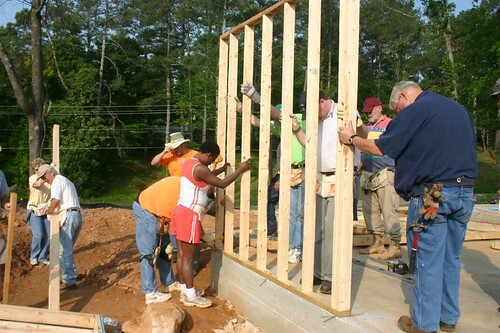 Men on the inside lifted the truss into position on the wall and against the safety pole and then shifted as necessary to get the proper alignment. The truss rests outside of the blocking put in the previous week and firmly against the poles. Finally it was nailed securely into place. Each of the remaining trusses were hefted up in a similar fashion. 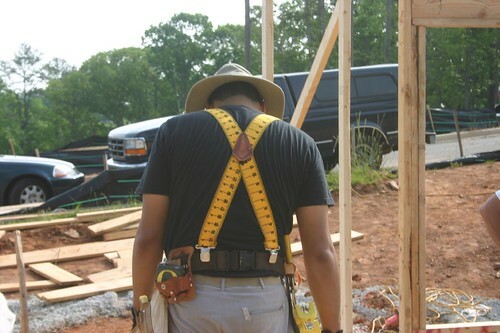 One “safety man” had the job of making sure that no one working on the top side was caught between an incoming truss and walls or trusses already in place. Thankfully no one got hurt. 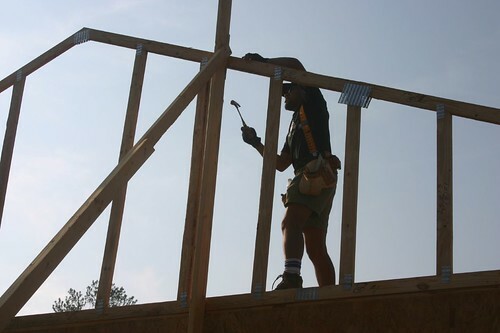 Special jigs hold the tops of the trusses exactly two feet apart and keep them from falling over. Usually long 1×4 boards are nailed truss to truss across the top edge to ensure they do not separate or fall over. These are removed as the decking 4×8 sheets of OSB go up. This year we also had metal truss spacers that remain permanently. 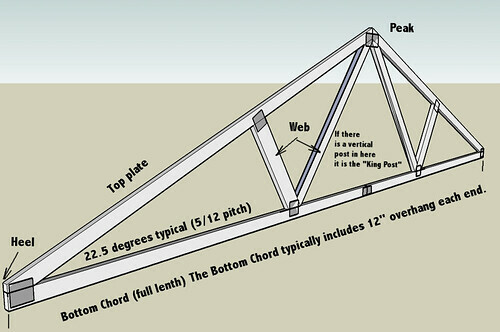 The picture at the left shows the spacer jigs on the first two trusses and the smaller metal truss spacers on the rest. 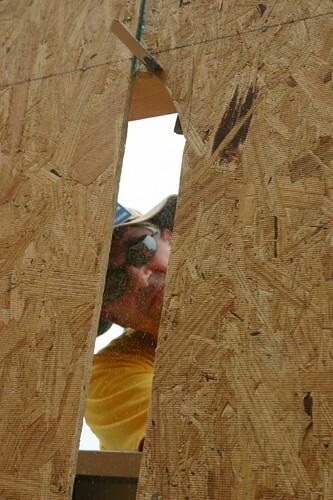 1×4 boards were added later as the number of trusses began to worry us about safety. If one of these trusses fall over they might all fall over and someone would definitely get badly hurt. We don’t take chances on Habitat builds. The last truss. The last truss was lifted entirely from the outside of the building. I think this is the most dangerous point of any build. The last truss is heavier than all the others due to the added OSB on the end, and it has to be raised straight up into position. The technique is to get it positioned below the wall and then lift it to the top of waiting stepladders. Wise Guys steady the truss against the wall and the ladder men climb the ladders to get a higher grip. Finally the whole thing is lifted into position. It could easily slip off the 1.5 inch ledge it sits on and it could also easily tip too far toward the other trusses and leverage itself off the ledge or with real tragic results tip backward and fall on the whole crew. Thankfully it went smoothly. 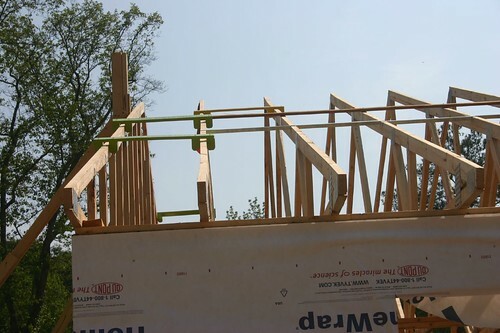 The truss is firmly nailed along the blocking on that end of the house and the tops joined with spacer jigs and then 1×4 boards tieing them firmly together. Other things going on. 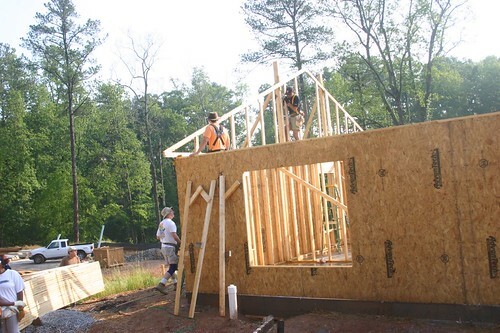 Even before the first truss went up, there was a crew set up to wrap the house in a waterproof wrap. In this case Tyvek. It seems as if it is a rule that this stuff always goes on upside down. It actually depends on which direction you choose to wrap the house. Right to left, right side up. Left to right, upside down. Guess which way everyone goes. Once the wrap is started, another crew begins marking the studs on the edge of the slab and marking vertical lines on the wrap. These are so the siding nailers can find the studs easily. 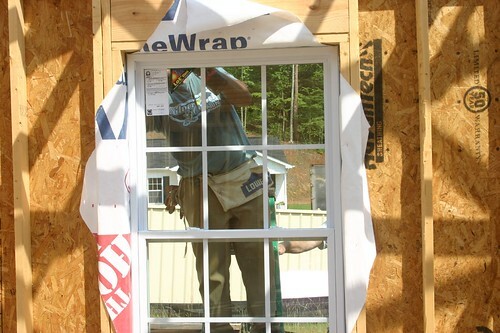 Also once the wrap is started, the window installers go to work. Each window is set into place and nailed in. Then someone comes behind them and puts on vertical and horizontal strips of tape to seal the window edges from any chance of leaking. There is a strict procedure on the order of installing the strips. Decking A deck crew is started on each end of the house. 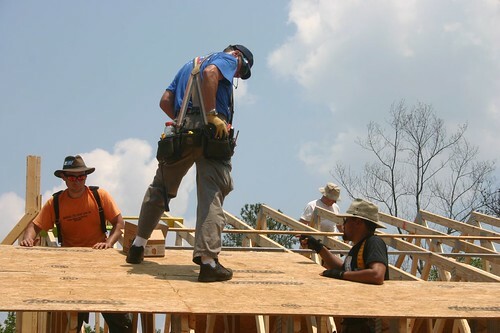 It starts with two people working within the trusses reach down to pull up 4×8 sheets of decking. The placement of the first sheet is critical. It determines the angle at which the entire roof runs from one side to the other. Get it a 1/8 of an inch too high on one end and by the time you put 8 sheets down, the roof is a full inch out of alignment on the other end. Several attempts to use the 47 inch marks (gives 1 inch overhang) gave bad alignment due to the rafters being shifted ever so slightly from one to the next. Finally a string was snapped from one end to the other and the first sheet was properly aligned on that. The decking proceeds from one end of the house to the other, then by rows above that. Soon there are 4 to 6 people on the roof working above the first row. The porch and storage/laundry roofs use small trusses that span their length. 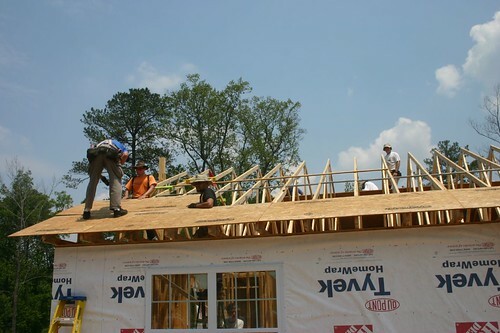 Once the trusses get to the edge of the main roof, the remainder of these smaller roofs are “stick built”, meaning they are constructed using hammer and nail. Once a deck is completed a crew begins covering it with tarpaper. We didn’t get that far today. The porch beam got another “do-over” because one was cut a little too short and the other was cut a little too long. A little work with a saw-all by Jim Miller fixed it all up. This Oldtimer cut out about here (picture above), with the roof less than half decked. The previous week I was so pooped I could hardly keep my eyes open going home. Sorry guys I left a little early. Boss’s orders. You don’t keep a bride 48 years without knowing when to say OK! There are 35 photos from build day 2 in the slide show at the link at the beginning of this piece. Take a look. The two earlier slide shows are also linked in case you missed them. The last (end of day) picture came from the PCCH website blog. 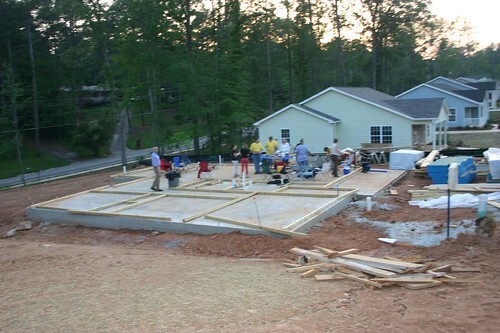 Our next build on May 19th, 2007. If you are in the Cobb County, Georgia area, come on by. We can shore put you to work. 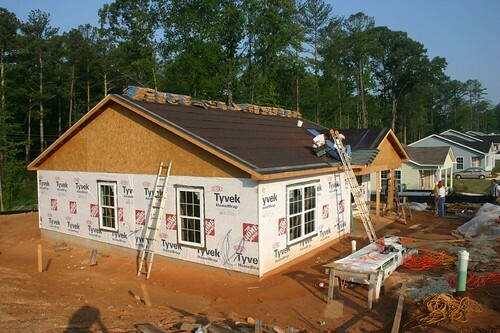 We will teach you how to roof and side a house. 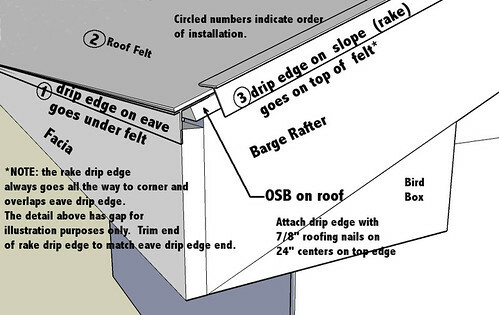 Shingles and Hardi Plank lessons here! Go to the PCCH website for directions and map.